Expectant Mother Blessings are blessings for the mothers. They are to prepare the mother spiritually, emotionally and physically for the birth of her baby. Blessing of the mother can be done at a Blessingway or during a Baby Shower or alone and can be done for a mother awaiting her adopted child to arrive. This is a celebration of the woman, uplifting her and restoring her before she has to give her all in birthing and caring for her baby. This can be a ceremonial blessing for the mother or it can be a light hearted gathering, either way the mother is to be pampered, and friends and family give her thoughtful gifts and make the day all about the woman who is soon to be a mother for the first, second or multiple times. Blessingway Ceremonies can be done separate from a baby shower or during one, which are Baby Shower Blessings, or take the place of one. 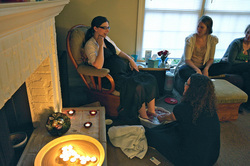 Pregnancy Blessings can be done one on one with me blessing the sacredness of mother and birth. This can be performed at a baby shower, but vary from a Blessingway as it does not require the participation of friends and family. A traditional Blessingway takes around 3 hours or more, and is a celebration of the divine feminine within the pregnant mother. Most Blessingways are done within a close group of women friends and family, but feel free to choose whomever the mother-to-be would like to attend. 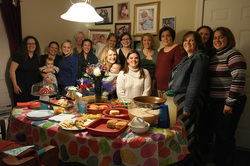 Potlucks are usually organized for the event. 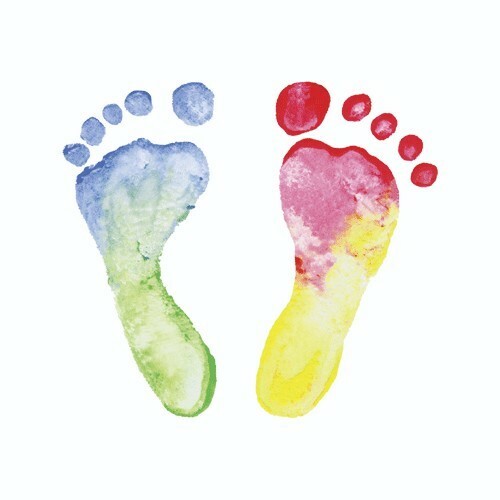 If done during a baby shower (a Baby Shower Blessing) it can be shortened with a blessing and only two or three of the activities to allow time for other baby shower celebrations and games. A Pregnancy Blessing generally has fewer activities. Generally the only activities are that I bless the mother and perform the foot and hand cleansing and pampering. I have provided below an explanation of activities. Keep in mind the type of ceremony you are looking for and what you think would fit best for the celebration that you are planning. The Pregnancy Blessing can be a great baby shower gift to an expecting mother. I can also provide a pretty gift certificate for those wishing to offer that ceremony as a gift to be done later. The Mother-to-be gets to go back in time and feel her most feminine with the ancient act of having her crown adorned with flowers. Guests can choose to make a wreath and place upon the mother while brushing or braiding her hair. -OR- They can simply intertwine flowers throughout the mother's hair and around the crown of her head. I provide the fresh flowers. Mother-to-be gets to be pampered as she relaxes and enjoys a hand and foot cleansing and oil or the traditional cornmeal treatment which is wonderful for the skin and used in the Native American Blessingways. I provide the materials needed. Guests can choose to bring their own special bead, or choose from my simple assortment, to string together a necklace for the mother to wear until the birth of her child. This is a reminder for the mother of all the love and support she has for herself, her baby and her birth. Those unable to attend can also send in a bead to show their support. All the guests wrap a red yarn around their wrist interconnecting them all with the mother. The red yarn is then cut into each persons individual wrist piece and tied. The "bracelet" is to be worn until the birth of the baby. Then each person "cuts the chord" when she hears of the birth. Connecting all to the mother and the baby and the birth! I provide the yarn. Each guest can share a poem/reading/blessing they wrote or find meaningful to them and would like to share with the mother. Those unable to attend can mail/email their reading as well. Each guest brings a candle and lights it from the mother's candle. Then everyone blows the candles out at the same time. The candles are re-lit when the mother goes into labor. (A phone chain is organized.) I can provide candles for an additional fee. Painting of the mother's pregnant belly by me and/or guests with non toxic paints. Paints wash off with water and soap, mother should wear or have a change of clothes that can get paint on them. Mother receives framed picture of painted belly for keepsake. Henna Application done by me and/or guests on the pregnant belly.